Would you pay for online Newspaper? "Would you pay to read online version of NY times?" With respect to India – Times of India, Hindu, Hindustan Times everyone of them faces this problem. I suspect Indian newspapers to not make more than a million dollar per annum (or even lesser) in terms of ad revenues for their e-version. Comparatively NYtimes, WSJ make more money through their online version, but so far the online revenue is too small to begin to compensate for the losses from print advertising. Very obvious reason for such a scenario is that not many want to pay for their newspaper. Let it be physical or virtual. I have not read a physical copy of NY Times or WSJ. But my experience with traditional newspaper is that the content is too generic. Even connoisseurs of news would not read up more than 50% of the content in it. News can be more targeted and the content generated can be better utilized. So here are some suggestions, which can improve users experience. Why not have a personalized version of newspaper? Some version of the same e-paper can have more tech news, or more entertainment and sports news or even more news about latest cars. Basically users might need customization in what they read, if they are going to pay. Imagine yourself reading a TOI with news about the latest mobile startup that has propped up in Uganda or a review on Tesla. 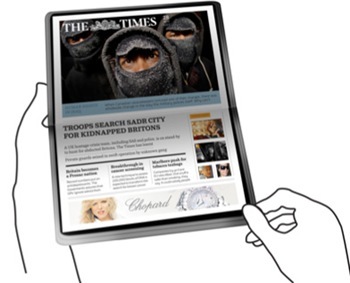 The advantage of a personalized e-paper is targeted advertising. You can understand what users want and improve your advertising revenues. How about best YouTube videos of the day ? or newer/older videos from YouTube that is related to the content. None of the traditional newspapers allow users to post content. There might be problems with copyrights, but that can be sorted out if the users experience is going to improve. Basically, the image of a ‘newspaper’ has to change when it comes online. I do not want a NY times or a TOI newspaper. I want a personalized newspaper that can cater to my likes and dislikes.’MY’ newspaper! Whats your opinion? would you pay for a personalized e-paper ? Youtube hits 3 Billion Views a day..Wow ! Well e-reading is a good idea but reading news for hours on the net causes strain in my eyes so i get my traditional newspaper every morning which just costs me 3 bucks. I would not pay a dime. Information is free or it is supposed to be free or it has been free so far. If someone asks me to pay for the information then I would see if I can live without that information. In most cases the answer would be a resounding yes. I can live without information. Then why pay for it? So, newspapers have to re-invent and may be come up with better advertising model. That is the only way they can make more money. Coming to personalization, by definition it is personal. So how can someone personalize my personalization? Valid Point Himanshu!!! But again, the idea is whether we will pay for it even after its personalized to our taste based on auto-personalization. Given the taste and preferences can be dynamic in nature, i dont think anything automated will work.Moreover, if the paper guys do customize it on demand, the cost and time factor might just be too much to cope with. Arun, may be addition of insight into Murdoch’s views link would also be useful. It definitely makes sense for a personalized version. As pointed out Advertising would be a major thing. In fact, I never read e-paper that comes into my mailbox , the reason is the headlines that come into the mail is not so appealing. The other point is about “Auto-Personalization” through Analytics [Just a thought]. Just like when Google knows everything about you, the newspaper site would also know about you based on the time you spend on a particular page[e.g Sports, Politics,Gossip, Technology]. This cumulative data can help them to send a specific news to a specific person. eg. If I read only Tech when I open the E-Paper, tech headlines should come in the mailbox..which improves their readership as well !!! no way will i pay for the newspaper unless its dirt cheap like in India (where you can get a paper for just Rs1). On the net, the papers need to find alternate ways of monetising the site. When info is so freely available today, why should i pay money to read something from NYT or TOI etc? Anyway, who has the time today to read long analytical articles? I just skim thru the headlines and go off. Very rarely read thru any long articles anymore. WSJ and NYT have been trying to move from the subscription model(I was a paying member to WSJ until a while back) from article based payment. i.e you pay only for a particular article instead of the whole paper after seeing a small snippet. I remember reading this in WSJ sometime back, but for someone reason they chopped the idea. I cant see this or online paid subscription picking up in India unless its for the finance/business sector. Personalization is a very good idea and its for the same reason why the paper based version are dying and people are moving to RSS feeds/blogs which cater to specific interests. However there will always be a small market to read random articles out of your interest, since its more random – kind of like listening to a radio, but yeah, that market is getting smaller and smaller. But a single company producing personalized is going to be hard. Why? Because NYT or WSJ have a small team of journalists to write sections on each category, say technology,politics (note that these sections are by itself very broad,you can talk about more granular customization).So it maynot be possible to cater to everyone’s interest seperately since the content is going to be low. Instead they focus on producing good content which most people would be interested in, regardless of thier interest with some newspapers having a slightly inclined focus. For eg,Economic Times and Business Week cater to same interests but I prefer ET bcos they seem to cover less on traditional industries and more on tech compared to Biz week. What I think is more than the method, we need a medium to be able to read online newspapers with ease. Traditional papers has some very genuine advantages which can’t be taken away by our PCs or Lappys. Moreover we are very much comfortable with free news roaming around over net, so its very difficult to make us pay for general news. But I think we need a combination of both a method and medium to bring in the next revolution in paper/book reading. Except for the ‘leisure feel’ and accesibility in several places traditional newspapers has several disadvantages.But I get your point of medium which might cause a substantial difference in the markets. Thats nice to know abhijith.Share more info on this. does the papers you refer allow users to post content? btw,ur link is not working. The best adapted newpaper sites, if you ask me, are the UK ones: guardian.co.uk, telegraph.co.uk and timesonline.co.uk. They feature video reports along with text, blogs by their own reporters and latest news items done by their staff. In fact, they get a lot of sccops about American news – their links are regularly passed around the blogosphere. I think your ‘personalization’ point is a over exaggerated – because all it will take is a little bit of script tweaking to a registered user and the news you like only will be shown, once you login. That already takes place. I have a lot to write on this matter, it will be a very big comment, so I will blog this and send you a link soon.